How do you assist customers to transact digitally, and provide alternatives for those who can’t? 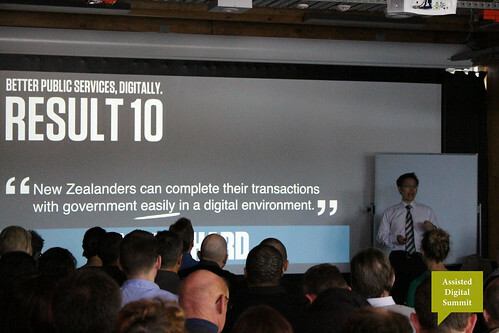 That’s the question posed by Action 1 in Result 10’s Blueprint and the question we found ourselves trying to answer on Tuesday 24 June in a room full of public servants, community organisations, tech start ups and customers. But our beginnings were much more humble. When I (re)joined the Result 10 team in April 2014 to lead Action 1, I inherited a very well intentioned, but ambitious deadline — to hold a Summit on Assisted Digital in June 2014. What soon became apparent was that the scope of assisted digital was huge. At the first meeting of our Advisory Group we quickly learnt that agencies were working across the spectrum of customers – some helped the seven per cent of New Zealanders without internet access, while others were focused on keeping (or moving) the 93 per cent of New Zealanders with internet access in the digital channel. How to design a summit about service design? When it came to designing the Summit, the vastness of our scope was very much at the forefront of my mind. How could we bring people together in a way that harnessed the wealth of knowledge and ideas among the collective while focussing our efforts to achieve a concentrated output? The answer? An open space event where we would let participants set the future direction of assisted digital by creating prototypes. As an approach it was perhaps equally ambitious as the Summit deadline. But, we set the date. We sent out invitations. One mantra amongst open space converts is that “the right people are the right people.” The technique values participation, rather than observation. It disrupts the conventional conference model of sitting and listening by getting people moving and talking. 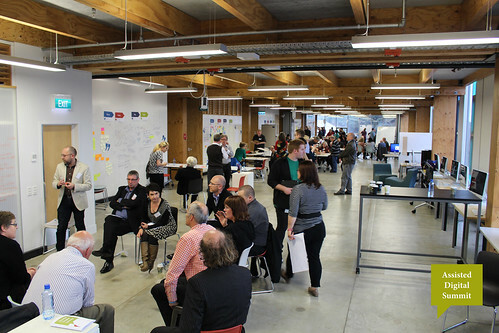 We thought a lot about space and hired Massey University’s Open Lab in the Athfield designed College of Creative Arts. At 446 square meters of open space it perfectly embodied our ethos for the day. We discovered that we could have an in-house barista for the same price as regular tea and coffee. We booked him. The espresso bar provided a unique focal point for participants entering the space. Upon arrival, participants were given notebooks designed by our intern Amie Holman that laid out different service design methods as well as giving them space to write. They were asked if they would like a coffee and shown into the main space where we would be prototyping later in the day. Finally, a few minutes before we began participants were shown through to the seated area where we were holding the presentations. We had organised a 6x6; six speakers from across the assisted digital spectrum speaking for six minutes each as an injection of ideas for the beginning of the day. We had deliberately left showing people to their seats until the end, so they were encouraged to stand, engage with others and the space when they first arrived. In the seated area, we had colour coded the seats to mix up participants so that when they stopped to chat in-between speakers (first the person on their left, then the person on their right, then the person behind them, etc. ), they were greeted with a different view of the world. With all this the scene was set and we were off. We got off to a good start. The seating arrangement worked and in the first interval between speakers when Donna Goodwin, Design and Innovation Manager here at Result 10, asked participants to discuss three questions with their neighbours it was obvious attendees were eager to speak with each other. They were also busy scribbling away in their notebooks. When it came to asking the participants to set the agenda for the afternoon’s prototyping session, we received more than 25 suggestions. While the participants took a well deserved break, we worked with facilitators from our service design network to cluster these into just over a dozen key questions, before people self-selected the groups they wanted to work in. At the prototyping session we threw more than a dozen customers of government services into the mix, not as curiosities to be observed, but as equal participants there to give ideas and critique work. One customer ended up leading the group on how to get government to communicate in plain English. As for the number of participants, we need not have worried. A few days before the event, RSVPs were in the low 90s. We expected a drop-off rate of 10–15 per cent on the day. As it was, more than 120 people appeared. Cue our logistics guru, Dominic Tupu, calling the caterers with revised numbers, emergency printing of additional notebooks and finding more seats. Although it was an event based on the principle of self-organisation, a great deal of thought went into the logistics of making it happen. Some things we had not anticipated. Because it was a day-long session, we had organised packed lunches on trays for participants that were taken to them in their working groups. The idea was that as groups they would decide if or when they took a break. We did not set a scheduled break for them as we did not want to disrupt their momentum. But some participants were uncomfortable with the ambiguity. The afternoon’s prototyping process was also something we could have better communicated as it was new for some attendees and some jumped to solutions before properly defining the problem, speaking with customers, or developing a range of ideas. But in the main, the Summit was a success. The quote I found myself returning to often in the days after the Summit was If you do what you’ve always done, you’ll get what you’ve always gotten. We needed a way to convert our vast scope into prototypes we could develop into feasible pilots. By using an open space format we got that and more. New working relationships were formed between participants and much of the feedback we received (left on feedback postcards distributed at the end of the day) was people asking to take part in developing the pilots further. What part, then, does an advisory board (or even the concept or reporting up to an advisory board) have in co-design? How many of the participants were actual customers compared to the number of participants who are existing government employees (i.e. consumers vs "designers" of services)? I would argue that co-design is a more succinct term than wiki's longer definition, but it's pretty much the same! The Advisory Group (rather than Board) is made up of Result 10's partner agencies. The structure of R10 means that our actions can only be achieved in collaboration with our participating agencies and therefore speaking with them is always our starting point. The group could equally be called a working group. They are there to endorse a collective approach and learn about each others activities. They participated in the Summit and will very much be guided by what came out of it when thinking about future activities, so I don't think it conflicts or is incompatible with a co-design approach. On the day we had at least a dozen customers of government services. None were government employees. They were parents, students, retirees, small business owners etc. So a ratio of about 1:10 (although those 10 weren't all govt employees), which felt right for the event given we also included community sector representatives, tech companies, and representatives from across more than ten agencies. I'd be interested in hearing from others about the ratio of customers to other attendees they have involved for similar events.